They're called convenience checks for a reason. You open up your mailbox and there sits an envelope from your credit card company telling you that you have to open it right away. There's an exciting offer is inside! When you open the envelope you find a bunch of blank checks with a well written letter telling you that this special offer allows you to write a check for purchases instead of using your credit card. But that’s where the convenience ends. It’s easy but using those checks is not in your best financial interest for a number of reasons. Let’s take a look at why those credit card convenience checks need to take a one way trip to your shredder. There’s a reason that you both love and hate your credit card and that’s because of the interest rate. Your credit card may act as the bridge between paychecks but at sometimes more than 20% interest, you’re flushing more money down the drain than you realize. If you thought the interest rate on your credit card was bad, take a look at what you’ll pay for those convenience checks. Convenience checks have the same interest rate as a cash advance on your card and it’s often quite a bit higher than your normal rate. What grace period? With your credit card, you have a grace period where you aren’t charged interest providing you pay the balance in full when the statement arrives. After that, interest starts to add up. With convenience checks, the interest kicks in as soon as you use the check. No grace period here which means there is no sound financial reason to use these checks. If the lack of grace period and high interest rate wasn’t enough, you’re probably going to be charged a three to four percent fee for using them. The credit card company will call it a convenience fee but it’s actually the normal fee that a merchant would pay if you used your card. If you thought it was easy for thieves to get a hold of your credit card, those convenience checks that come in the mail are even easier. Before you even know they came in the mail, thieves can take them and use them leaving you with a mess that will take a lot of time to clean up. Another little known fact is that the credit card company can often refuse to honor the convenience check for any reason. Take for example this story of a gentleman who used the check to put a $1000 down payment on a Toyota Prius. The credit card company refused the check shortly thereafter simply because they felt he was overutilizing his credit. Although the arguments might be flimsy, using a credit card, in some cases, makes financial sense. If you are the type of person who can pay the full balance at the end of every month, you can build up some healthy rewards points. With credit card convenience checks, however, there is no responsible reason to use them unless a true financial emergency exists. 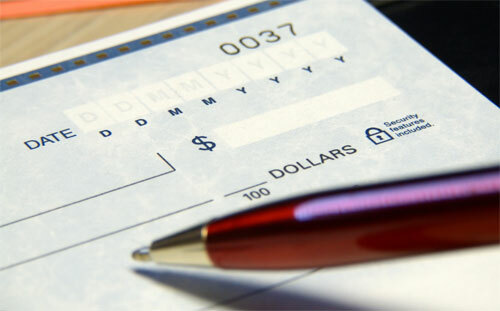 When you get these checks in the mail, take them directly to the shredder or tear them up in to small pieces before throwing them away. Remember that convenience checks are everything but convenient. Have you ever used convenience checks? I rip them up the second I receive them. Every. Time. I didn’t know that they could just refuse them. That seems pretty shady. This is a great post. I dont use credit cards at all anymore but i remember getting (and using) these checks years ago. Huge mistake as the interest rate grace period always caught me before i was able to pay off. Completely agree. Shred them! Next Post: Are You Falling Victim To Price Anchoring?